Stay inside maybe? Not this lot – there was something important to be done. Up they went to the very top of Mount Ainslie. 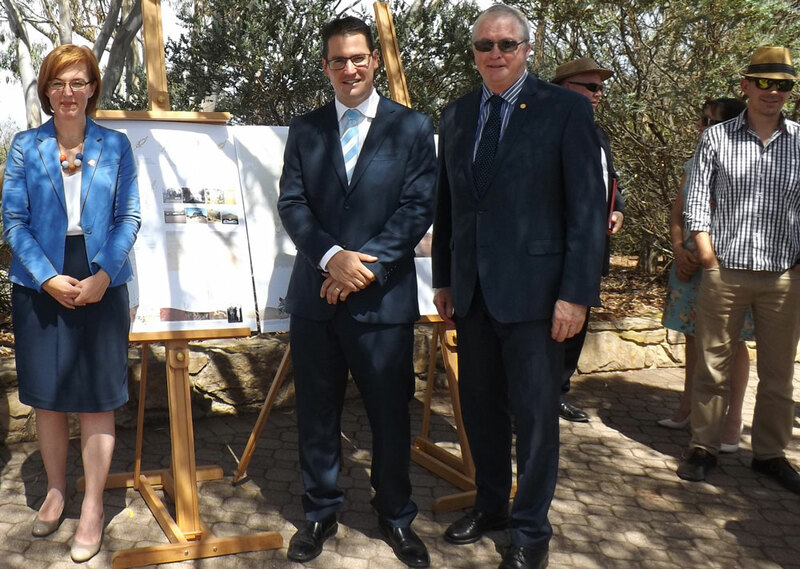 They gathered there to carry out the formalities of announcing the winners of the Mount Ainslie national summit design competition. 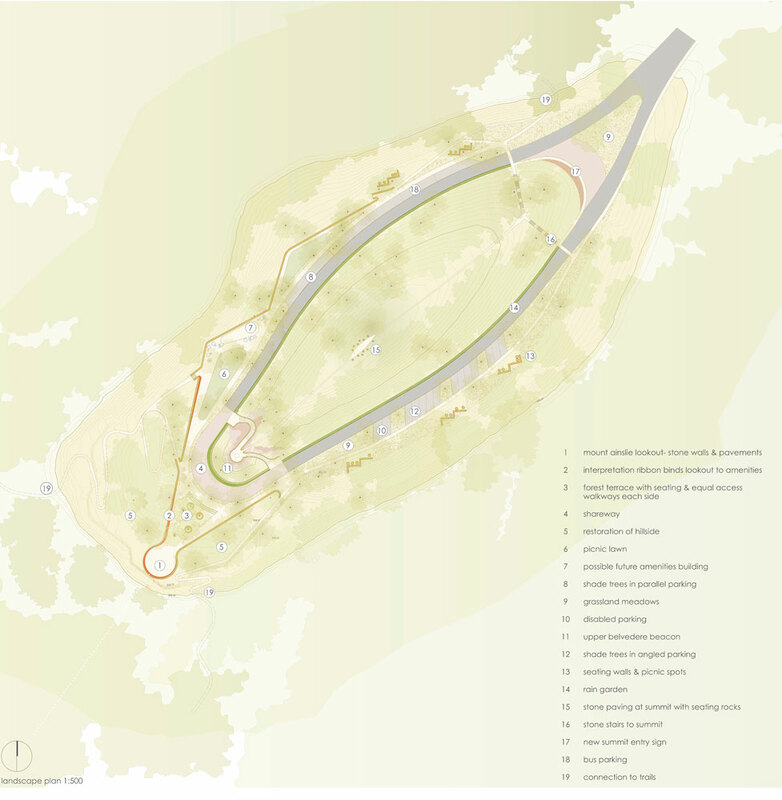 The winning entry was by landscape architects from Sydney – again not locals. One still hopes that the project delivery will involve local landscape design expertise. The city needs to be providing such opportunities for locals to enhance their skills, experience and profiles. Outside ideas are always welcomed – occasionally. But ACT Government should have a strategy to invest more in locals and to spend money locally on such key projects with local designers who in turn put something back into the local economy. There’s a load of useful stuff online about this winning design – click here. The design comes in three stages, being 2, 5 and 10 years – so it might be a while yet before the completion of the enhancements to the top of Mount Ainslie. Any project that is spun out over ten years can be altered many times over before it is finally delivered – that’s the story of Canberra right from the very start. It also means that funds will have to be allocated through successive budgets for this whole project to be fulfilled. I suggest that the new TAMS Minister, Meegan Fitzharris, should get the funds allocated to have the whole project finished in a much shorter timeframe – two years sounds right. The danger now is that the designers involved with the delivery could get carried away and deliver some infamous archi-park monstrosities (they like them in Sydney). The other extreme is that a dumbing down could happen due to small budgets and the result ends up being boring. Examples of these extremes happen frequently within local governments. This is a good project and congratulations go out to whoever initiated the idea (I hope they were present – even if they were not named). We now have to keep our fingers crossed that the new TAMS Minister is capable of keeping a close eye on things, gets enough funds allocated to get the job done properly and soon, and that she does not get bamboozled by the design-speak that consultants and her own project managers often use. Best of luck to her with all of that! The above is a photo of some of the dignitaries on the day: being from left to right – the ACT Minister Meegan Fiztharris, Senator Zed Seselja and NCA Chief Executive Malcolm Snow. Have a good look. What is missing? Did they not listen to their mums and their teachers at school? Just where are their hats? I hope their children do not see this. And what are those two dudes doing wearing dark suits out on such an extremely hot day? Whereas the guy to the far right knew how to dress for such an outdoor event. One last comment – the elephant in the room – with all these new facilities and picnics areas and the encouragement to take your time on your visit to the top of the mountain – no one is mentioning that there are no toilets to be had anywhere up there. Too difficult? So for now – keep those fingers crossed that this good idea is delivered with sensitivity, is not messed around by too many cooks and that the government gets real and allocates sufficient funds to have it all done sooner rather than later.